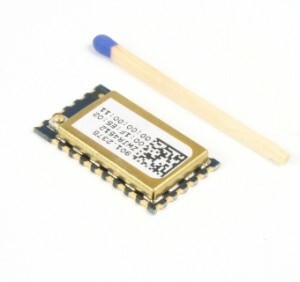 The 6LoWPAN module enables secure low-power wireless IPv6 communication for sensors and small devices. It comes with user-programmable, royalty-free 6LoWPAN stack with mesh routing capability. 6LoWPAN is an Internet Engineering Task Force standard to develop wireless, low-power sensors and devices on IP communication. Your low-power network on 6LoWPAN can easily be integrated into an existing LAN or WLAN or can operate autonomously. You can access to the 6LoWPAN network by any device that is supporting IP communication easily (laptops, tablets or smartphones). Secure communication is provided on Internet Protocol Security (IPSec) and on Internet Key Exchange Protocol version 2 (IKEv2). This gives you highly secure end-to-end communication if ever your package hops over unsecured network nodes. The 6LowPAN module is powered by an ARMâ„¢ Cortex M3 uC and provides GPIO and peripheral interfaces. 192kB of flash memory and 32kB of RAM are available for your application. Several low-power modes are provided to save energy. Â These features help you to get a long stand by time on battery.Â The module supports 868 / 915 MHz to reach higher distance in buildings. I’m strongly interested by this product. I need to develop a generic board with multiple phy and Mac layers based on proprietary, Zigbee and 6LowPan protocols. Could you tell me which distributor supplies it? Thanks a lot by advance for your reply. Pierre-Henri, the module supports 6LoWPAN on 868 / 915 MHz. ZigBee is on 2400 MHz only. If you really have a need for multiple phy and Mac layers based on proprietary, Zigbee and 6LowPan protocol then you have to select somthing on 2400 MHz.